While Labor Day may be the end of summer for most, we know our San Francisco summer is just getting started. Jump start your morning with something refreshing during our THIRTEEN HOUR HAPPY HOURS everyday starting at 6am! 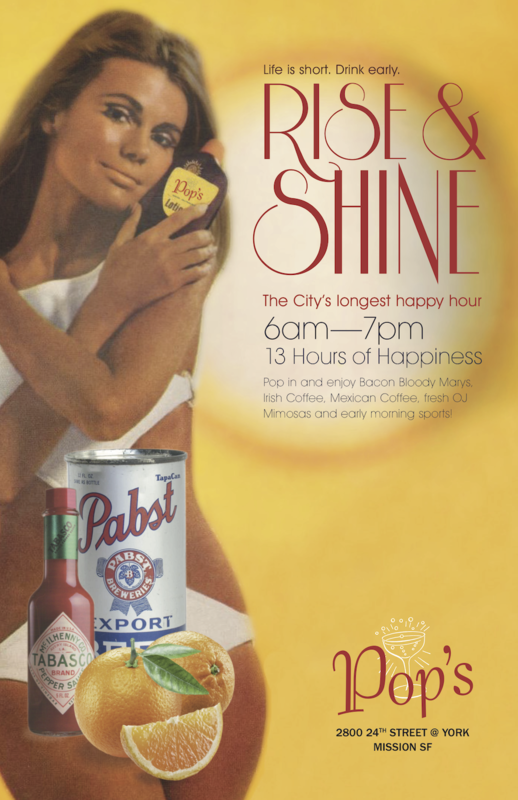 Bacon Bloody Mary’s, Irish Coffee, Mexican Coffee, Fresh OJ Mimosa, Pabst…remember it’s always 5 o’clock somewhere. So kick back and unwind, Pops is your official starting point in the Mission. Nick Pal spins short songs because life is short. Hard rock, power pop, punk and pop vinyl. The “STERLING” SOUL NIGHT has moved to Pop’s Bar!!!!! Now on the first Wednesday of the Month with Matty Holt and special guest Muddbird of Resonate! Rotating DJs from local BFF.fm radio! This week: Music Ninja: Ash & Dom: eclectic mix of new releases fused with tunes from the pioneers who inspired our contemporary favorites. Come support local community radio. Lester T. Raww spinning music from the 1920’s, 30’s & 40’s. Need something funky for your weekend wind down? Every 2nd Sunday, Pablito and friends bring you “BOPS at Pops”. Old and new hip-hip, fresh-groove bangers, classic soul hits and everything in between. Stop by for tasty drinks, share your smiles in the complimentary photo booth and shake some damn tail feathers! Whatever your flavor we’re sure to keep your head boppin’!